Fake news is in the news. And it has, apparently, got to to be stopped. I agree. In which case I think it essential that the government, BBC, the Office for Budget Responsibility, economists and others stop lying about the extent of the government's debt. It takes only the most cursory review of some data to reveal the extent of this lie. For example, in the OBR public finances databank they say that at 31 March 2015 they say the UK national debt was £1,548.5 billion. For the record that is £374 billion less. And that number is no coincidence, of course. That is almost exactly (uncannily) the same as the amount of quantitative easing undertaken from 2009 to 2012 once non-government assets are taken into account. But the point is that the sums held by banks with the Bank of England are not, as such, national debt and are instead operating consequences of monetary policy. And they are subject to some control as a result. Which means they are not national debt - which is precisely why they are not described as such in the accounts. So, to put it another way, national debt is not now in excess of £1.7 trillion, as is repeatedly said by politcians, newscasters and economists. It has been reduced by the amount of QE operations. That means that by March this year it is likely that national debt will not be £1,725 billion as preidcted by the OBR but will instead be that sum less £435 billion of QE, or £1,290 billion. That's more than 25% less than the government claims, which as lies goes is a pretty big one. And note what that also means. 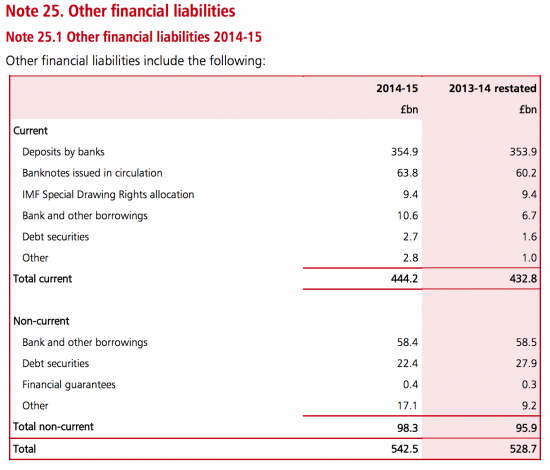 According to the OBR the government will borrow £68.2 billion this year. But that is also not true. £60 billion of QE has to be offset against that. 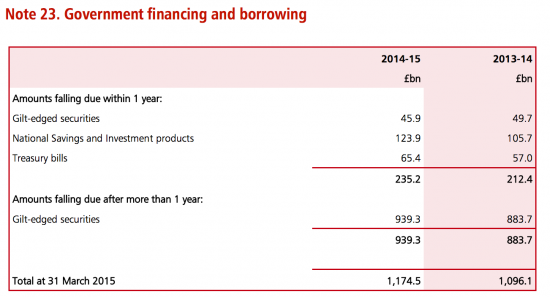 The government will in fact only borrow £8.2 billion this year. In that case why austerity? Why a local authority funding crisis? They're all based on a lie. It's time we stopped fake news and told the truth about government debt. Because right now this country is being impoverished by fake news. And that's costing real people their lives, quite literally. So silly semantics can’t disguise the lie – because it is a lie. The usual insightful and myth debunking blog to start 2017, Richard. Thanks. Just to add that when discussing fake news it’s well worth reading this article by John Naughton on how the right has come to dominate the internet. It add’s some interesting material that is generally less discussed (and understood) but will become increasingly so once Trump starts to run the presidency of the US via his twitter account. Maybe I will have to do more Twitter then…. “A lie gets halfway around the world before the truth has a chance to get its pants on”, do you wish to be sitting on the toilet at 3 o’clock in morning to compete with the twittering loonies, its not healthy for mind or body. My recent observation confirms the all- pervasive fake news surrounds us. Statistics, Politics in particular [we won’t even discuss the “Donald” Trump] and very much in economics. Now I am no professional economist, but I get the point here stated. My interest is in Crude Oil and here the news reporting on so-called factual figures has numbers that I would constitute bad guess work, but are reported as conclusive facts. These leads one to make judgements based on the “best guess” basis. Sad it is. No wonder they don’t take kindly to “EXPERTS”, who are numerate and persistent. Great article. What is more worrying is the new mode of Govt the Tories have developed, post truth austerity keeps them in [permanent] power whilst an honest pro-economic pro-citizen administration will see them out of power – loss aversion? Gerrymandering and other new practices, e.g. voter identity verification, are aimed at keeping Tories in permanent power. The mendaciousness of the media can hardly keep up with the post-truth world; was it ever different but not so severe a condition? Many important people are keeping quiet – why? They would lose their high status, income and power to boot. You have to [not] admire the Establishment for its cold cruelty. I don’t know directly of people dying but I do know of the increased suffering of many ordinary citizens, carers and NHS workers who are on the brink, with loss of support and with emotional and financial overload, but never heard. Richard could you please clarify something for me. The BoE used QE to buy Gov bonds, forcing yields lower, and ensuring that deficit financing via Bonds was viable. Those who seem to think this is not just printing money, point out that the BoE will at some point in the future sell these Bonds back into the market and “retire” the money. If the BoE and Gov simply cancelled the Bonds held by the BoE now, and at some later date needed to “drain” money from circulation (presuming a boom), then all the Gov needs to do is issue new bonds and “retire” that money (via some accounting method). Are the BoE selling the QE bonds back into the market and retiring the money, and the Gov selling new Bonds and retiring the money the same from an the perspective of the Gov balance sheet? If it is, then is the reason the QE debt will not be cancelled purely political, in that a future Gov would find it very difficult to justify selling bonds and not using the money raised to spend on Gov expenditure, where as the BoE could (in theory) sell the QE bonds back into the market and “retire” the money as part of it’s “usual” market activity (although selling QE bonds would be anything but usual!). MMT economists wouldn’t describe this as a debt anyway. MMT Economists certainly would consider it ‘debt’ but MMT considers all ‘money’ as both an asset & a liability (debt). As above in note 25.1 banknotes are a liability, there isn’t really much difference between gilts & banknotes (1 is dated & pays interest, the other is undated and doesn’t) they are both on the same side of the Government’s balance sheet. MMT shows that government debt & private debt are not the same & that’s the difference. Well, not the MMT economists I read, which are the well known ones. It’s an inconvenient word that confuses Jo Public about the nature of Sovereign Bonds and not a true description of the facts. Actually if you bothered reading the disabled campaigning sites you would know that thousands of disabled people are dying after being sanctioned and after being found fit by the austerity programme illegally inflicted on the sick, disabled poor and old, as stated by the UN. Wasn’t austerity always based on errors, if not outright lies, as evidenced here http://www.mirror.co.uk/news/uk-news/george-osbornes-favourite-economists-reinhart-1838219 and once that error was exposed, did it make any difference at all to Osborne? It did not. He carried on just as before. He and his ilk are killers, no less. It’s high time they were recognised as such. This is not about economics…. its about pulling the wool over the eyes of the electorate, Throwing huge figures about to frighten us into submitting to yet more austerity. There are other agendas going on….. keeping a pool of people close to absolute destitution, to make them so desperate to work they will sign up for any zero hour contract offered. Its about trying to turn our working state into one that competes with China. a race to the bottom, where only the top 1% win. I am deeply concerning whats going on in the world…. with Trumpsim….environmental change… no-one in power seems really concerned with doing much about it, and yet they have control of the economic leavers that could make a huge difference.